Still testing it out, but give it a try: http://news.culturecrime.org. For several years I’ve been collecting media reports about the looting of archaeological sites, the theft of art and antiquities, and all sorts of crime and legal entanglement related to cultural objects. The resulting database has become a valuable tool for my own research, and in the spirit of open data, I’ve been searching for a way to make the information I collect available. Scanning online media for relevant articles is a time-consuming task (it takes at least an hour every day) which results in approximately 70 newly-published articles added to the database per week. I don’t want any other researcher to have to repeat what I’ve already done. In 2014 I began publishing a weekly news round up on my blog, Anonymous Swiss Collector. Those posts can be found here. 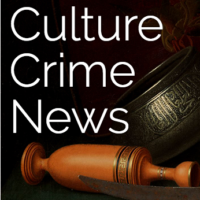 Shortly after I started the posts, I created the Culture Crime News email list, an email version of the blog post, which is sent out every Monday. You can sign up for the list here. I also post all new articles to my twitter account daily. Yet none of the above retained the searchability that I have access to on my own system. I want people to be able to find what they are looking for quickly and efficiently. Thanks to the spectacular work of Tony Garnock-Jones, my favourite computer science collaborator, this database site is integrated with what I already do to archive these articles and put them to use. I highly recommend that you read the FAQs before you get started searching so that you understand some of the decisions we’ve made. Are you using this database for something interesting? Let us know about it! Please note that CultureCrime.org is unfunded. It, like many things, is an an attempt at how things should be in academia, not how things are. I think it is important, even vital, that academics put a ‘public face’ on what they do, to support each other and the interested public by sharing all aspects of their work and creating usable and free tools so that everyone might better understand our world. If my research has shown anything, it’s that we’re all in this together.